Here are three different mono mini takes on one of the most commonly-referenced monsters--the wicked witch. This is a character that can be seen around everywhere at least once a year, at Halloween time, and there have been a lot of witch-related toys created over the years. But as mini figures go, I think the three pictured are the only ones I own. First, we've got the Monster in My Pocket witch from the first series of the line. Although she was one of the lowest point monsters in the line, this is a pretty cool version; she's got an appropriately ugly and demented face, and her hair was sculpted to look like it's blowing in the wind to give a bit of a dynamic quality to the figure. In the middle is my favorite--the witch from the Japanese keshi line Necros Fortress. I love how horrible-looking her face is; Between the gigantic, twisted nose, the long, pointy chin and the evil gaze, she looks downright wretched. It's also cool that the sculpt has her riding on her broom. In comparison, the Terrible Monster/Monsters & Goblins witch, in red plastic, is a bit dull. I do like that she's all hunched over and looks to be casting a spell on someone with her bony, outstretched finger, but all in all she doesn't look nearly as formidable as the others. 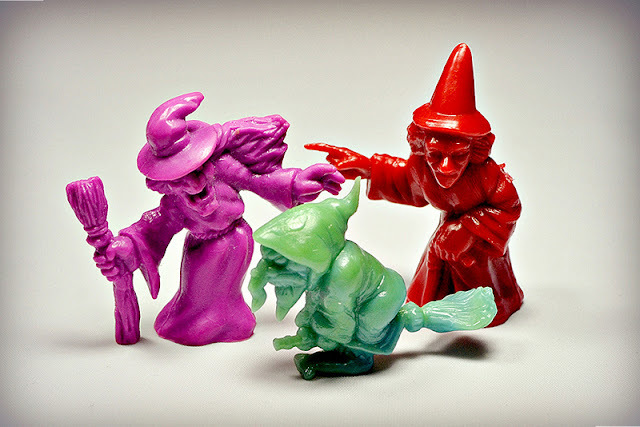 Can you think of any other witch mini figures? There's also the other "types" of witches that MIMP did, such as Baba Yaga, the Elbow Witch and Jenny Greenteeth - would they count? I've only recently got hold of some Terrible Monsters, so that witch is still fairly interesting/exciting for me (considering I've been after some of them for about five years now!). Ah yeah, true! I was just thinking of the standard type of witch (hat, broomstick, etc). I do like the Terrible Monsters witch, she just doesn't look quite as wicked. Glad you were able to get a hold of some of those, they're pretty cool!